This month we released a new version of our free tool MDQC with extended features. In this version — 0.4 — we have incorporated additional functionalities that allow the user to further refine filtering in order to provide more control over the scanning process. We have created a series of posts to provide examples and point to useful tools that can complement these new features. In this post, we will review how to refine the scanning process using specific filtering methods, integrating old functionalities and the new feature Base Filename Import. The addition of the Base Filename feature allows you to use MDQC to answer a different question than past versions. Past versions allowed you to answer the question “Do ALL of the files within a given location meet particular embedded metadata specifications?” The problem that comes up when this is the only question that can be answered is that there are multiple scenarios in which that question is too general and it results in either having to scan files you don’t want to scan or move the files you want to scan to a separate directory. The latest version allows you to explicitly identify the exact files you want to test so that you can answer the question “Do these EXACT files meet particular embedded metadata specifications?” If this still isn’t clear, hopefully this blog post will clarify with an example. 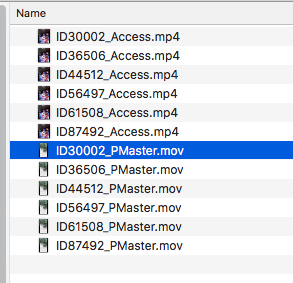 In this case, there are a series of master files (all files with .mov extension) and their corresponding access files (.mp4 files). File ID3002_PMaster.mov contains embedded metadata that I have previously QC’d and approved, and therefore, I want to use this file as my reference file in MDQC. Clicking on Metadata Rules, I can select the specific metadata tags I want to validate and the arguments for each tag. In this case, I want to make sure that the Image Size field is exactly 1280×800 and that the Video Frame Rate field will not exceed 60fps. I only want to scan the master files (ending in .mov) from delivery two for conformance with these particular specifications because I know the access copies will have different specifications and I have already performed QC on the previous deliveries. In past versions of MDQC, I would have only been able to do this if I segregated the files from the latest delivery into their own directory before scanning. Otherwise I would have had to scan all of the master files in this directory to QC the latest files. With the base filename feature added in MDQC 0.4 it is possible to be more explicit about the files that you want to perform QC on regardless of how they are organized. The base filename feature allows you to upload a .csv file in which each row represents the beginning of a specific filename. Used in combination with Scan Rules to set additional general rules I have a lot of control over defining what I want to scan and QC. To begin, I click on the […] to the right of Directory to Scan, to select the directory I want to scan. In this case, MDQC will only scan files that end with “.mov,” leaving out all of my access derivatives I don’t want to include in this test. Then, I click on the […] icon to the right of Base Filenames to upload the .csv file I just created. The combination of scan rules and base filename upload will result in searching for only the three files I have defined. To initiate the scan I click on on Begin Test. Want to know more about MDQC’s new features? Check our next review: Using MediaInfo files as Surrogates for Media Files.